On April 23, 2014, Governor Nathan Deal signed into law House Bill 60, otherwise known as the Safe Carry Protection Act of 2014. This is one of the most sweeping weapons legislation changes in Georgia to date. The bill passed with strong majorities in both the House and the Senate and will take effect July 1, 2014. The recent changes in firearms legislation brought about by the Safe Carry Protection Act of 2014 will affect how law enforcement professionals interact with persons who choose to exercise their right to legally bear arms in public places, including county and city parks and recreational facilities. This document attempts to address some common questions and misconceptions about current firearms legislation and the recent changes brought about by House Bill 60. What is a Georgia Weapons Carry License? In general, a person must possess a valid Georgia Weapons Carry License to carry a handgun or other weapon either openly or concealed in Georgia (other than on their property or inside their home, car, or place of business). There are exceptions for persons employed as peace officers, district attorneys, solicitors-general, judges, wardens, and persons in the United States military service. For a complete listing of exceptions and exemptions, please refer to the Official Code of Georgia Annotated (O.C.G.A.) Section 16-11-130. Can a person with a weapons carry license enter a government building with a weapon if the government building is open to the public and has no security personnel manning a security checkpoint? Generally yes, except as discussed below. What should an employee do if a person carries a weapon into a Gwinnett County government building that does not have security personnel manning a security checkpoint? Absolutely nothing, unless you have a reasonable suspicion that the armed person has, is, or is about to be engaged in disorderly or illegal activity, such as pointing a firearm at an individual, brandishing a firearm, or setting the weapon down on a counter. In this case, the employee shall immediately alert a law enforcement officer. Under no circumstances shall the employee approach the person carrying the weapon to inquire about it. Can a person with a weapons carry license enter an open government building with a weapon if the building has security personnel manning a security checkpoint? directions for removing, securing, storing, or temporarily surrendering the weapon. The person also cannot be charged with carrying a weapon into an unauthorized place if he or she leaves the restricted area after being notified that he or she cannot enter with it. Must the County have a POST-certified person manning a security checkpoint at a government building to prohibit the carrying of weapons into the building? Yes, in order to charge a person with the offense of entering an unauthorized place with a weapon. Otherwise, such charges cannot be sustained against a weapons carry license holder. Under House Bill 60, at least one member of such security personnel must be a POST-certified officer. Can the County prohibit weapons carry license holders from entering an open government building with a weapon by posting signs prohibiting weapons? No. Weapons carry license holders may enter an open government building with a weapon if the entrance is not restricted or screened by security personnel. What is the definition of a government building? House Bill 60 defines a “government building” as (1) a building in which a government entity is housed; (2) a building where a government entity meets in its official capacity; or (3) the portion of any building that is not a publicly owned building that is occupied by a government entity. Can a person with a weapons carry license enter, with a weapon, a courthouse, jail or prison, mental health facility, nuclear power facility, place of worship? No. However, a place of worship, by action of its governing body or authority, may allow weapons. Also, a person with a weapons carry license cannot be charged with the offense of carrying a weapon in an unauthorized place if the person approaches security personnel, notifies them of the presence of a weapon, and explicitly follows their directions for removing, securing, storing, or temporarily surrendering such weapon. Can a person with a weapons carry license travel with a weapon within 150 feet of a polling place? Can the County have a policy that county employees are prohibited from bringing weapons into the workplace? Yes. However, the county may not maintain a policy that restricts employees from possessing weapons locked in their personal vehicles parked in parking lots accessible to the public. Can a weapons carry license holder openly carry a firearm while walking around Gwinnett County parks or recreational areas? while exercising their right to bear arms in either an open or concealed fashion. In Georgia, the legislative regulation of weapons and firearms is reserved for the Georgia General Assembly. 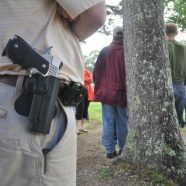 Isn’t a person with a weapons carry license supposed to carry their weapon in a holster, concealed from view? Especially in a public park where there may be children present? No. In Georgia, weapons license holders may carry a weapon (i.e., pistol, revolver, knife, etc.) openly or concealed in any non-prohibited location in accordance with Georgia law. There is no legal requirement for weapons to be carried in any type of holster. However, the weapon must be carried on the person (and not set on a table, bench, chair, etc.). If I see an armed person walking along a trail at a county park, can I request the police to respond and check this person out? It goes without saying that the safety and security of Gwinnett County residents and visitors is of paramount concern. That being understood, Georgia law maintains that law abiding Georgia residents and non-residents who possess weapons carry licenses have the right to freely visit locations in our state, while armed, that are not deemed off-limits by state or federal law. Although code section 16-11-137 (newly established in House Bill 60) clearly states that weapons license holders shall have their valid weapons carry license in their immediate possession at all times when carrying a weapon, this does not mean that law enforcement or any other person can detain an armed person (such that they are not free to leave) simply to check whether they are in compliance with this requirement. Outside of a voluntary casual conversation with the armed person, the law enforcement officer or other person must have reasonable, articulable suspicion (which must be based on more than just the simple possession of the firearm) to believe that the armed person has been, is now, or is about to be involved in criminal activity in order to detain the person and investigate further. What can law enforcement do about an individual in a county park who is yelling at passersby and who also happens to possess a firearm? In this particular example, if law enforcement officers find reasonable, articulable suspicion that the armed person has been acting in a reckless or disorderly fashion or they witness the disorderly behavior firsthand (addressed by both local ordinances and state law), Georgia law permits law enforcement to detain the person and investigate him or her further. This investigation would include, among other things, a check of the person’s identity, warrant status, and eligibility to possess a firearm and whether the person has a weapons carry license in his or her immediate possession. Officers will also determine whether probable cause exists indicating that the armed person has violated one or more criminal laws, and if so, determine whether an arrest should occur. I see someone walking inside the aquatics center at a county park with a military-style rifle slung across his shoulder. Is this legal? Can people walk around with loaded rifles and shotguns in county parks when there are lots of people around? Yes. In Georgia, if a person is not prohibited by law from possessing a firearm,, he or she may carry a long gun such as a rifle or shotgun in locations that are not off-limits. Public parks generally are not off-limits. A weapons carry license is not required to openly carry a long gun. However, if the long gun is loaded, it must be carried in an open and fully exposed manner. Can a weapons carry license holder openly carry a weapon that is not a firearm, such as a knife, knuckles, nun chuck, or stun gun, in a county park, library, tag office, or government building that has no security personnel manning a security checkpoint? Yes. Georgia law defines a “weapon” as any pistol, revolver, dirk, bowie knife, switchblade knife, ballistic knife, or any other knife having a blade of two or more inches, straight-edge razor, razor blade, spring stick, knuckles, blackjack, bat, club, or other bludgeon-type weapon, nun chahka, nun chuck, fighting chain, throwing star, oriental dart, or any weapon of like kind, and any stun gun or taser. Can a weapons carry license holder openly carry a firearm while in a library? Yes. Georgia law does not prohibit weapons license holders from possessing firearms or other weapons in libraries. Provided that they are not engaged in some other illegal activity within the library, a person with a weapons carry license can visit a Gwinnett County library while exercising their right to bear arms in either an open or concealed fashion. In Georgia, the legislative regulation of weapons and firearms is reserved for the Georgia General Assembly. Can a weapons carry license holder openly carry a firearm while walking around the Gwinnett County tag office? Yes. Georgia law does not prohibit weapons license holders from possessing firearms or other weapons in government buildings, including Gwinnett County tag offices. Provided that they are not engaged in some other illegal activity within the tag office, a person with a weapons carry license can visit a Gwinnett County tag office while exercising their right to bear arms in either an open or concealed fashion. In Georgia, the legislative regulation of weapons and firearms is reserved for the Georgia General Assembly.